Have you taken the opportunity to listen to the Choral Music? If you purchase a download product the link to download the product will be provided in the email you receive once your purchase transaction is complete. The download product is free of tax and shipping and handling, and can be enjoyed immediately. Buy the Thank You for Sharing song in .mp3 format. The download link for the Lyric Sheets is included with this purchase also. This special song, Thank you for Sharing from the Treasures CD, was released on CD November 9, 2001 at the Association for Christian Schools International (ACSI) Conference held in Colorado Springs, CO and was sung by the children's choir from the Colorado Springs Christian School. It is a tribute to all Christian teachers and day care providers who daily give their best and sacrifice their time to insure our children receive a good and proper Christian education. The specific download links will be sent to you by email once your purchase is complete. There is no tax or shipping and handling on this product. 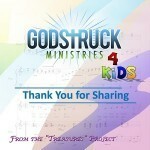 Buy the Thank You for Sharing song in .mp3 format. The download links for the Lyric Sheets and Sheet Music are included with this purchase also. This special song, Thank you for Sharing from the Treasures CD, was released on CD November 9, 2001 at the Association for Christian Schools International (ACSI) Conference held in Colorado Springs, CO and was sung by the children's choir from the Colorado Springs Christian School. It is a tribute to all Christian teachers and day care providers who daily give their best and sacrifice their time to insure our children receive a good and proper Christian education. The specific download links will be sent to you by email once your purchase is complete. There is no tax or shipping and handling on this product.